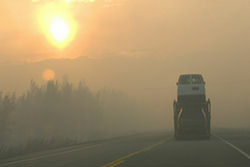 Alaska's Parks Highway closed due to a forest fire, less than a mile up ahead. The fire is burning on the left (west) side of the road. Officials expected the road to be closed for at least another five hours. Click on the photo for a larger image. On 7 June 2006, while happily driving along the George Parks Highway from Anchorage to Fairbanks (Highway 3), about 20 km (12 miles) south of Nenana and only 64 miles from our destination Fairbanks, we suddenly found our way blocked. 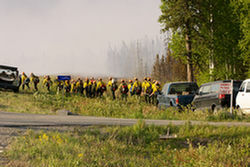 The road had been closed because of a wildfire burning close to the road, less than a mile further down. The fire had started only a few hours earlier on the east side of the road, and by the time we got there it wasn't very large yet. But it was burning out of control due to the dry and very windy conditions, and it had already crossed the highway and was now burning on the west side. It was 19.00 hours, and according to the officials it could take until midnight or even longer for the road to re-open. With the Parks Highway being the only road in this part of Alaska, we didn't like this at all. The only alternative to get to Fairbanks would have been to head back and take the Denali Highway. This would be a detour of nearly 400 miles, with lots of gravel roads, and probably take 7 hours or more. Welcome to Alaska... So, with no viable alternative, we decided to wait, hoping the road would re-open a bit sooner. Busy times in the skies over the Parks Highway in Alaska. Tanker 46 and birddog Beech 90 N39Q meet up while they both circle the area. Click on the photo for a larger image. This turned out to be a very good decision. We had been waiting there for only 10 minutes or so, when a low-flying Beech 90 arrived at the scene, making low passes all over the area. The Parks Highway is lined with trees, so we couldn't see exactly what it was doing, but this certainly appeared to be a "birddog" plane (called ASM in the USA, for Aerial Supervision Module), scouting the fire and determining where the drop lines for the big air tankers should be. This looked promising! 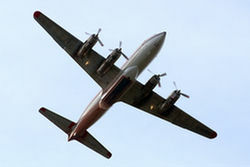 And sure enough, after only a few minutes DC-6 Tanker 46 came roaring over our heads! A little later DC-6 Tanker 51 and CL-215 Tankers 264 and 267 joined in, all of which made multiple drops. Two Bell 212's also joined, presumably for local structure protection. And while the birddog plane kept making its low passes, sometimes followed by a big air tanker, an AS350 Ecureuil (N68CQ) continued to circle the area. It was very busy in the skies over the Parks Highway! And as you can see from the photos, we were thoroughly enjoying ourselves... Don't forget to click on the pictures to see a larger image! 19.18: Tanker 46 circling in front of the fire's dark smoke clouds, with the pilots observing the simulated drop runs made by the birddog plane below them. 19.24: When given the clear, Tanker 46 comes in in a low left turn, as it follows the example of the birddog. 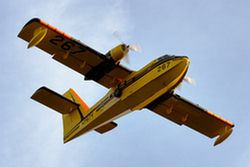 The crew will try to drop their load of retardant at the exact place shown by the birddog. 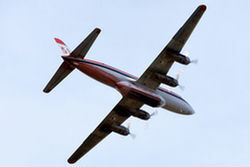 19.25: Although partly hidden by the trees, a DC-6 tanker obviously carries a big load of red retardant. 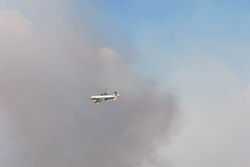 The image of the aircraft itself is distorted by the heat generated by the fire. 19.30: With Tanker 46 on its way back to Ft. Wainwright for a reload, Tanker 267 makes a right hand turn-in to drop its load of water in the same spot. 19.30: Obviously no retardant here, but plain water. As Tanker 267 empties its tanks, Tanker 264 can be seen in front, climbing out after it has made its drop only seconds before. 20.14: Two Bell 212 helicopters are making dozens of runs, continuously crossing the highway as they reload on the east side and drop on the west side. 20.15: Even three tankers are not enough, and Tanker 51 joins the forces. 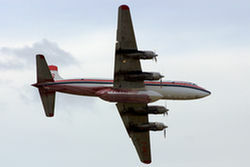 It's seen here roaring overhead, its rear belly stained red by previous retardant drops. 20.16: Tanker 51 turning left to make a drop run. The tankers are still dropping their loads at the same spot. There is obviously something there that needs serious protection. 20.42: Activity on the ground as well, as the ground forces move in. The sign on the right says 'Mile 290.8', which is where this fire started! 21.10: Tanker 51 suddenly dives at us from behind the trees, of course in the usual left turn (to give the captain a good and unobstructed view of the fire and the targeted drop site). 21.10: The tankers are still following a lefthand pattern, although the drop zone itself has now been relocated. Because of the omni-present trees, it was no longer possible for us to see the actual drops. 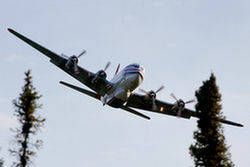 21.10: The four Pratt & Whitney R2800 radials make a wonderful noise as Tanker 51 once again grumbles low over our heads. I love those round engines! 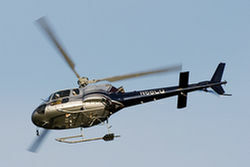 21.15: This AS350 N68CQ made several passes at a low altitude. 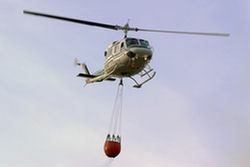 It carried the incident commander who was checking out the fire, and flew along the fire's perimeter to map its size using GPS equipment. 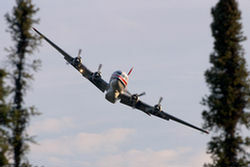 21.51: And again a DC-6 tanker diving at us from behind the trees, this time it's Tanker 46. 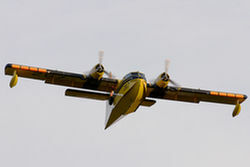 This would be the last drop by these venerable aircraft we would get to see this evening. 21.51: It is an unbelieveble experience, to watch these wonderful aircraft, piloted by some truly amazing men, do their work. 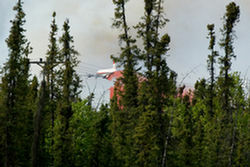 Tanker 46 turns in to make its third drop on the Parks Highway Fire. 22.07: Tanker 267 looks somewhat grumpy from this angle. It had just made a drop somewhere nearby and is now passing low overhead, on its way to Minto Lake about 80 km (50 miles) up north, to scoop up another load of water. 22.07: Thanks to the long Alaskan days, we were able to continue our photography until the very last moment. Tanker 267 gave us a wonderful opportunity, with the low sun reflecting in its prop blades. 22.16: The road was temporarily reopened, and we were allowed to continue, in close file, escorted by the police. Without any doubt, this had been the most pleasurable three hour wait of my entire life. 22.19: Bell 212 N16973 has just reloaded for the umpteenth time, this time in a small pond beside the road, just north of the fire area. We were still driving in file, escorted, and not allowed to stop, so I had to shoot it from a moving car as it climbs out to make another drop on the other side of the road. 22.41: By now it was getting really late, a bit too late for good photography, even in Alaska. 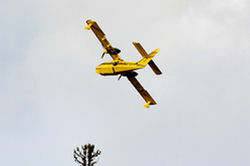 But I was still able to capture Tanker 264 as it overflew Nenana Airport on its way south to deliver another load of water on the flames of the Parks Highway Fire. 22.45: At Nenana Airport, an old C-46 is watching the horror that approaches it from the south. At this moment the Parks Highway Fire is still about 16 km (10 miles) away, but two days later it would burn the trees in the background. The massive smoke plumes are still lit by the setting sun. 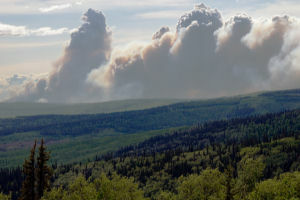 The immense Parks Highway Fire three days later, as seen from about 40 km (25 miles) away. Photo taken on 10 June 2006, in the late afternoon. Click on the photo for a larger image. In hindsight this may very well have been a once in a lifetime experience for us. I consider myself very lucky to have witnessed all this from such great front row seats, and to have been able to capture much of the scene on photo. 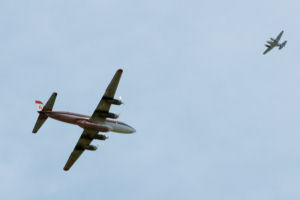 Although we never got the see the fire itself (the authorities kept us well away from the flames), we did get to see the magnificent air tankers in action. Now that I have seen them at work, I hold these people (the pilots as well as the fire fighters on the ground!) in very high regard. Yes, this certainly was a large fire. 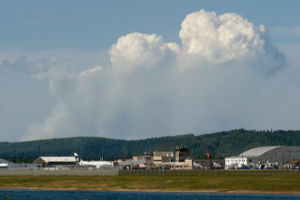 Even from about 65 km (40 miles) away, the towering clouds of smoke dominate the skies over Fairbanks International Airport. Photo taken in the morning of 10 June 2006. Click on the photo for a larger image. As it later turned out, the Parks Highway Fire had started only a few hours before we were stopped, and was still rather small when we were there. It had started right where we were, at a home at Parks Highway - Mile 290.8 (the "Kolwicz Trail 290.8" sign is visible in one of the photos), when a careless home owner had dumped the hot ash from a burn barrel. 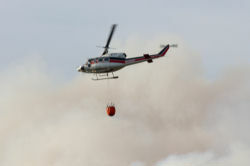 Due to the dry and very windy conditions, the fire continued to grow rapidly, and at 21:29 hours, when helicopter N68CQ had completed its mapping of the fire, they reported its size at 8.12 km2 (2007 acres). Two days later it became a major threat to the small city of Nenana, 12 miles to the north, causing some evacuations. 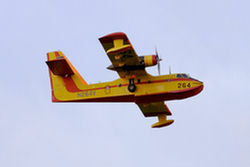 By that time 400 firefighters and six air tankers were battling the flames. 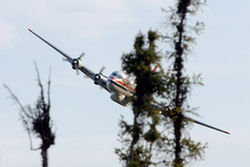 Nenana Airport is located just south of the town, and served as a welcome barrier to keep the flames away. The Everts C-46 N54514, shown in the last photo above, had stranded at Nenana Airport a few days before, due to engine troubles. 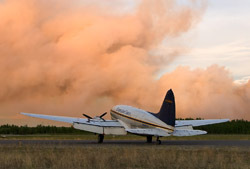 To avoid their aircraft being consumed by the flames, Everts Air Cargo hurriedly solved these problems and ferried their aircraft away from Nenana. It arrived safely at their homebase at Fairbanks International Airport the next day, by coincidence right when we were having our tour there. 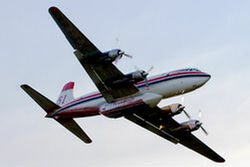 The next day, 8 June 2006, even more air tankers were called in, in an attempt to get the fire under control and keep it away from Nenana. That day we saw Conair's Tanker 44 (Convair 580 C-FFKF) and Tanker 49 (Convair 580 C-FKFL) arriving at Fairbanks International Airport for a short stop to settle some customs affairs, before continuing to the air tanker base at Ft. Wainwright. 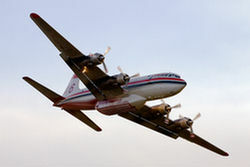 We stayed at Fairbanks for a few more days, and both DC-6s and the Convairs were seen flying on and off between the air tanker base at Ft. Wainwright, just east of Fairbanks, to the Parks Highway Fire 65 km (40 miles) west of Fairbanks. 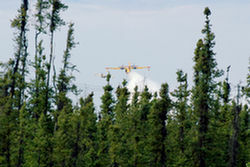 Four air tankers were not enough to battle the Parks Highway Fire, and so reinforcements were called in. 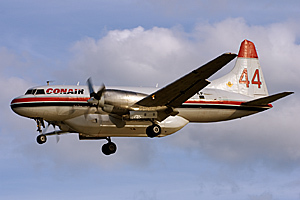 This photo shows Conair Tanker 44 C-FFKF arriving at Fairbanks International Airport on 8 June 2006. Click on the photo for a larger image. Initially the fire was named the Tamarack Fire, but it was soon renamed the Parks Highway Fire. 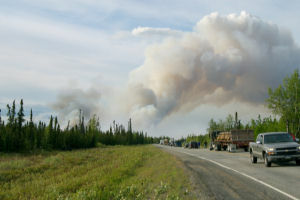 It turned into a major fire, raging intensely for more than four weeks, during which it consumed more than 467 km2 (115,500 acres) of forest south and east of Nenana. Per late July it was still classed as the biggest fire of the 2006 fire season in the entire United States, but in August and September this record was broken by several even bigger fires burning in the states of Idaho, Nevada and Montana. In the end it continued to smoulder for three more months, and was finally officially declared out on 1 November 2006. By then 526 km2 (130,187 acres) of forest had been destroyed.